Chiang Kai-shek (ចិន ៖ 蔣介石; 31 October 1887 – 5 April 1975), also romanized as Chiang Chieh-shih and known as Chiang Chungcheng (ចិន ៖ 蔣中正), was a political and military leader who served as the leader of the Republic of China. From 1928 to 1948, Chiang served as chairman of the National Military Council of the Nationalist Government of the Republic of China (ROC). Chiang was socially conservative, promoting traditional Chinese culture in the New Life Movement and rejecting both western democracy and Sun's nationalist democratic socialism in favour of an authoritarian government. [ត្រូវការអំណះអំណាង] Unable to maintain Sun's good relations with the communists, Chiang purged them in a massacre at Shanghai and repression of uprisings at Kwangtung and elsewhere. Like many other Chinese historical figures, Chiang used several names throughout his life. That inscribed in the genealogical records of his family is Jiang Zhoutai (ចិនបុរាណ: 蔣周泰; វ៉េដ–ហ្គែយល្ស៍: Chiang Chou-t‘ai). This so-called "register name" (譜名) is the one under which his extended relatives knew him, and the one he used in formal occasions, such as when he got married. In deference to tradition, family members did not use the register name in conversation with people outside of the family. In fact, the concept of real or original name is not as clear-cut in China as it is in the Western world. In honor of tradition, Chinese families waited a number of years before officially naming their offspring. In the meantime, they used a "milk name" (乳名), given to the infant shortly after his birth and known only to the close family, thus the actual name that Chiang received at birth was Jiang Ruiyuan (ចិនបុរាណ: 蔣瑞元; វ៉េដ–ហ្គែយល្ស៍: Chiang Jui-yuan). In 1903, the 16-year-old Chiang went to Ningbo to be a student, and he chose a "school name" (學名). This was actually the formal name of a person, used by older people to address him, and the one he would use the most in the first decades of his life (as the person grew older, younger generations would have to use one of the courtesy names instead). Colloquially, the school name is called "big name" (大名), whereas the "milk name" is known as the "small name" (小名). The school name that Chiang chose for himself was Zhiqing (ចិន ៖ 志清; វ៉េដ–ហ្គែយល្ស៍: Chi-ch‘ing, which means "purity of intentions"). For the next fifteen years or so, Chiang was known as Jiang Zhiqing (Wade-Giles: Chiang Chi-ch‘ing). This is the name under which Sun Yat-sen knew him when Chiang joined the republicans in Kwangtung in the 1910s. In 1912, when Jiang Zhiqing was in Japan, he started to use the name Chiang Kai-shek (Chinese: 蔣介石; Pinyin: Jiang Jieshi ; Wade-Giles: Chiang Chieh-shih) as a pen name for the articles that he published in a Chinese magazine he founded: Voice of the Army (Chinese: 軍聲). Jieshi is the Pinyin romanization of this name, based on Mandarin, but the most recognized romanized rendering is Kai-shek which is in Cantonese romanization. As the republicans were based in Canton (a Cantonese speaking area, now commonly known as Guangdong province), Chiang became known by Westerners under the Cantonese romanization of his courtesy name, while the family name as known in English seems to be the Mandarin pronunciation of his Chinese family name, transliterated in Wade-Giles. Sometime in 1917 or 1918, as Chiang became close to Sun Yat-sen, he changed his name from Jiang Zhiqing to Jiang Zhongzheng (ចិន ៖ 蔣中正; វ៉េដ–ហ្គែយល្ស៍: Chiang Chung-cheng). By adopting the name Chung-cheng ("central uprightness"), he was choosing a name very similar to the name of Sun Yat-sen, who was (and still is) known among Chinese as Zhongshan (中山—meaning "central mountain"), thus establishing a link between the two. The meaning of uprightness, rectitude, or orthodoxy, implied by his name, also positioned him as the legitimate heir of Sun Yat-sen and his ideas. Not surprisingly, the Chinese Communists always rejected the use of this name and it is not well known in mainland China. However, it was readily accepted by members of the Chinese Nationalist Party and is the name under which Chiang Kai-shek is still commonly known in Taiwan. Often the name is shortened to "Chung-cheng" only ("Zhongzheng" in Pinyin). Many public places in Taiwan are named Chungcheng after Chiang. For many years passengers arriving at the Chiang Kai-shek International Airport were greeted by signs in Chinese welcoming them to the "Chung Cheng International Airport". Similarly, the monument erected to Chiang's memory in Taipei, known in English as Chiang Kai-shek Memorial Hall, was literally named "Chung Cheng Memorial Hall" in Chinese. In Singapore, Chung Cheng High School was named after him. Chiang grew up at a time in which military defeats, natural disasters, revolts, and the machinations of the empress dowager Cixi had left the Manchu-dominated Qing Empire destabilized and in debt. Successive demands of the Western powers and Japan since the Opium War had left China owing millions of taels of silver. He decided to pursue a military career. He began his military training at the Baoding Military Academy in 1906, the same year Japan left its bimetallic currency standard, devaluing its yen. He left for Tokyo Shinbu Gakko, a preparatory school for the Imperial Japanese Army Academy intended for Chinese students, in 1907. There, he came under the influence of compatriots to support the revolutionary movement to overthrow the Qing and to set up a Han-dominated Chinese republic. He befriended fellow Zhejiangese Chen Qimei, and in 1908 Chen brought Chiang into the Tongmenghui, an important revolutionary brotherhood of the era. Finishing his schooling, Chiang served in the Imperial Japanese Army from 1909 to 1911. Chiang returned to China in 1911 after learning of the outbreak of the Wuchang Uprising, intending to fight as an artillery officer. He served in the revolutionary forces, where he led a regiment in Shanghai under his friend and mentor Chen Qimei, as one of Chen's chief lieutenants. In early 1912, a dispute arose between Chen and Tao Chen-chang, who was an influential member of the Revolutionary Alliance and who opposed both Sun Yat-sen and Chen. Tao sought to avoid escalating the quarrel by hiding in a hospital but was discovered there by Chiang. Chen dispatched assassins. Chiang may not have taken part in the act but would later assume responsibility to help Chen avoid trouble. Chen valued Chiang despite Chiang's already legendary temper, believing that such bellicosity was useful in a military leader. Alternatively, Professor Pichon Loh reports that Chiang may have killed Tao in the hospital with a pistol. Chiang's friendship with Chen Qimei signaled an association with Shanghai's criminal syndicate (the Green Gang headed by Du Yuesheng and Huang Jinrong). During Chiang's time in Shanghai, he was watched by British-administered Shanghai International Settlement police, who charged him with various felonies. These charges never resulted in a trial and Chiang was never jailed. Chiang became a founding member of the KMT after the success of the 1911 Revolution. After the takeover of the Republican government by Yuan Shikai and the failed Second Revolution in 1913, Chiang, like his KMT comrades, divided his time between exile in Japan and the havens of the Shanghai International Settlement. In Shanghai, Chiang cultivated ties with the city's underworld gangs, which were dominated by the notorious Green Gang and its leader Du Yuesheng. On 18 May 1916, agents of Yuan Shikai assassinated Chen Qimei. Chiang then succeeded Chen as leader of the Chinese Revolutionary Party in Shanghai. Sun Yat-sen's political career was at its lowest point during this time when most of his old Revolutionary Alliance comrades refused to join him in the exiled Chinese Revolutionary Party. In 1917, Sun Yat-sen moved his base of operations to Kwangtung (now known as Guangzhou), and Chiang joined him in 1918. At this time Sun remained largely sidelined; and, without arms or money, was soon expelled from Kwangtung and exiled again to Shanghai. He was restored to Kwangtung with mercenary help in 1920. After returning to Kwangtung, a rift developed between Sun, who sought to militarily unify China under the KMT, and Guangdong Governor Chen Jiongming, who wanted to implement a federalist system with Guangdong as a model province. On 16 June 1922, Ye Ju, a general of Chen's whom Sun had attempted to exile, led an assault of Kwangtung's Presidential Palace. Sun had already fled to the naval yardទំព័រគំរូ:Sfnp and boarded the SS Haiqi, but his wife narrowly evaded shelling and rifle fire as she fled.ទំព័រគំរូ:Sfnp They met on the SS Yongfeng, where they were joined—as swiftly as he could return from Shanghai, where he was ritually mourning his mother's death—by Chiang. For about 50 days, Chiang stayed with Sun, protecting and caring for him and earning his lasting trust. 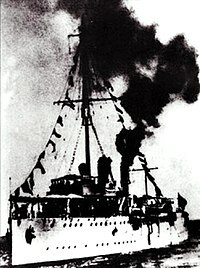 They abandoned their attacks on Chen on August 9, taking a British ship to Hong Kong and traveling to Shanghai by steamer. Sun Yat-sen died on 12 March 1925, creating a power vacuum in the Kuomintang. A contest ensued among Wang Jingwei, Liao Zhongkai, and Hu Hanmin. In August, Liao was assassinated and Hu arrested for his connections to the murderers. Wang Jingwei, who had succeeded Sun as chairman of the Kwangtung regime, seemed ascendant but was forced into exile by Chiang following the Canton Coup. The SS Yongfeng, renamed the Zhongshan in Sun's honor, had appeared off Changzhou—the location of the Whampoa Academy—on apparently falsified ordersទំព័រគំរូ:Sfnp and amid a series of unusual phone calls trying to ascertain Chiang's location. He initially considered fleeing Kwangtung and even booked passage on a Japanese steamer, but then decided to use his military connections to declare martial law on 20 March 1926, and crack down on Communist and Soviet influence over the NRA, the military academy, and the party.ទំព័រគំរូ:Sfnp The right wing of the party supported him and Stalin—anxious to maintain Soviet influence in the area—had his lieutenants agree to Chiang's demandsទំព័រគំរូ:Sfnp regarding a reduced Communist presence in the KMT leadership in exchange for certain other concessions.ទំព័រគំរូ:Sfnp The rapid replacement of leadership enabled Chiang to effectively end civilian oversight of the military after May 15, though his authority was somewhat limitedទំព័រគំរូ:Sfnp by the army's own regional composition and divided loyalties. On 5 June 1926, he was named commander-in-chief of the National Revolutionary Army and, on July 27, he finally launched Sun's long-delayed Northern Expedition, aimed at conquering the northern warlords and bringing China together under the KMT. On April 12, Chiang carried out a purge of thousands of suspected Communists and dissidents in Shanghai, and began large-scale massacres across the country collectively known as the "White Terror". Throughout April 1927, more than ១២០០០ people were killed in Shanghai. The killings drove most Communists from urban cities and into the rural countryside, where the KMT was less powerful. In the year after April 1927, over 300,000 people died across China in anti-Communist suppression campaigns, executed by the KMT. One of the most famous quotes from Chiang (during that time) was that he would rather mistakenly kill 1,000 innocent people rather than allow one Communist to escape. Some estimates claim the White Terror in China took millions of lives, most of them in the rural areas. No concrete number can be verified. Chiang allowed Soviet agent and advisor Mikhail Borodin and Soviet general Vasily Blücher (Galens) "escape" to safety after the purge. The decade of 1928 to 1937 saw some aspects of foreign imperialism, concessions and privileges in China, moderated through diplomacy. The government acted to modernize the legal and penal systems, attempted to stabilize prices, amortize debts, reform the banking and currency systems, build railroads and highways, improve public health facilities, legislate against traffic in narcotics, and augment industrial and agricultural production. Not all of these projects were successfully completed. Efforts were made towards improving education standards; and, in an effort to unify Chinese society, the New Life Movement was launched to encourage Confucian moral values and personal discipline. Guoyu ("national language") was promoted as a standard tongue, and the establishment of communications facilities (including radio) were used to encourage a sense of Chinese nationalism in a way that was not possible when the nation lacked an effective central government. Any successes that the Nationalists did make, however, were met with constant political and military upheavals. While much of the urban areas were now under the control of the KMT, much of the countryside remained under the influence of weakened yet undefeated warlords and Communists. Chiang often resolved issues of warlord obstinacy through military action, but such action was costly in terms of men and material. The 1930 Central Plains War alone nearly bankrupted the Nationalist government and caused almost ២៥០០០០ casualties on both sides. In 1931, Hu Hanmin, Chiang's old supporter, publicly voiced a popular concern that Chiang's position as both premier and president flew in the face of the democratic ideals of the Nationalist government. Chiang had Hu put under house arrest, but he was released after national condemnation after which he left Nanjing and supported a rival government in Kwangtung. The split resulted in a military conflict between Hu's Kwangtung government and Chiang's Nationalist government. Chiang only won the campaign against Hu after a shift in allegiance by the warlord Zhang Xueliang, who had previously supported Hu Hanmin. Throughout his rule, complete eradication of the Communists remained Chiang's dream. After assembling his forces in Kiangsi, Chiang led his armies against the newly established Chinese Soviet Republic. With help from foreign military advisers, Chiang's Fifth Campaign finally surrounded the Chinese Red Army in 1934. The Communists, tipped off that a Nationalist offensive was imminent, retreated in the Long March, during which Mao Zedong rose from a mere military official to the most influential leader of the Communist Party of China. Contrary to Communist propaganda that Chiang was pro-capitalism, Chiang Kai-shek antagonized the capitalists of Shanghai, often attacking them and confiscating their capital and assets for the use of the government. Chiang confiscated the wealth of capitalists even while he denounced and fought against communists. Chiang crushed pro-communist worker and peasant organizations and rich Shanghai capitalists at the same time. Chiang continued Dr. Sun Yat-sen's anti capitalist ideology, directing Kuomintang media to openly attack capitalists and capitalism, demanding government controlled industry instead. The Second Sino-Japanese War broke out in July 1937, and in August of that year Chiang sent ៦០០០០០ of his best-trained and equipped soldiers to defend Shanghai. With over 200,000 Chinese casualties, Chiang lost the political cream of his Whampoa-trained officers. Though Chiang lost militarily, the battle dispelled Japanese claims that it could conquer China in three months and demonstrated to the Western powers that the Chinese would continue the fight. By December, the capital city of Nanjing had fallen to the Japanese resulting in the Nanking Massacre. Chiang moved the government inland, first to Wuhan and later to Chongqing. A border crisis erupted with Tibet in 1942. Under orders from Chiang Kai-shek, Ma Bufang repaired Yushu airport to prevent Tibetan separatists from seeking independence. [ត្រូវការអំណះអំណាង] Chiang also ordered Ma Bufang to put his Muslim soldiers on alert for an invasion of Tibet in 1942. Ma Bufang complied and moved several thousand troops to the border with Tibet. Chiang also threatened the Tibetans with aerial bombardment if they worked with the Japanese. Ma Bufang attacked the Tibetan Buddhist Tsang monastery in 1941. He also constantly attacked the Labrang monastery. With the attack on Pearl Harbor and the opening of the Pacific War, China became one of the Allied Powers. During and after World War II, Chiang and his American-educated wife Soong Mei-ling, known in the United States as "Madame Chiang", held the support of the United States' China Lobby, which saw in them the hope of a Christian and democratic China. Chiang was even named the Supreme Commander of Allied forces in the China war zone. He was created a Knight Grand Cross of the Order of the Bath by King George VI of the United Kingdom in 1942. Chiang played the Soviets and Americans against each other during the war. He first told the Americans that they would be welcome in talks between the Soviet Union and China then secretly told the Soviets that the Americans were unimportant and that their opinions would not be considered. Chiang also used American support and military power in China against the ambitions of the Soviet Union to dominate the talks, stopping the Soviets from taking full advantage of the situation in China with the threat of American military action against the Soviets. Though Chiang had achieved status abroad as a world leader, his government deteriorated as the result of corruption and inflation. In his diary on June 1948, Chiang wrote that the KMT had failed, not because of external enemies but because of rot from within. The war had severely weakened the Nationalists, while the Communists were strengthened by their popular land-reform policies, and by a rural population that supported and trusted them. The Nationalists initially had superiority in arms and men, but their lack of popularity, infiltration by Communist agents, low morale, and disorganization soon allowed the Communists to gain the upper hand in the civil war. The former warlord Yan Xishan, who had fled to Nanjing only one month before, quickly insinuated himself within the Li-Chiang rivalry, attempting to have Li and Chiang reconcile their differences in the effort to resist the Communists. At Chiang's request Yan visited Li in order to convince Li not to withdraw from public life. Yan broke down in tears while talking of the loss of his home province of Shanxi to the Communists, and warned Li that the Nationalist cause was doomed unless Li went to Kwangtung. Li agreed to return under the condition that Chiang surrender most of the gold and US dollars in his possession that belonged to the central government, and that Chiang stop overriding Li's authority. After Yan communicated these demands and Chiang agreed to comply with them, Li departed for Guangdong. In the early morning of 10 December 1949, Communist troops laid siege to Chengtu, the last KMT-controlled city in mainland China, where Chiang Kai-shek and his son Chiang Ching-kuo directed the defense at the Chengtu Central Military Academy. Chiang Kai-shek, father and son, sang the Republic of China's national anthem while leaving the Academy all the way to the airfield. [ត្រូវការអំណះអំណាង] The aircraft May-ling evacuated them to Taiwan on the same day. Chiang Kai-shek would never return to the mainland. Despite the democratic constitution, the government under Chiang was a one-party state, consisting almost completely of mainlanders; the "Temporary Provisions Effective During the Period of Communist Rebellion" greatly enhanced executive powers, and the goal of retaking mainland China allowed the KMT to maintain a monopoly on power and the prohibition of opposition parties. The government's official line for these martial law provisions stemmed from the claim that emergency provisions were necessary, since the Communists and KMT were still in a state of war. Seeking to promote Chinese nationalism, Chiang's government actively ignored and suppressed local cultural expression, even forbidding the use of local languages in mass media broadcasts or during class sessions. Under Chiang, the government recognized limited civil and economic freedoms, property rights (personal[ត្រូវការអំណះអំណាង] and intellectual) and other liberties. Despite these restrictions, free debate within the confines of the legislature was permitted. Under the pretext that new elections could not be held in Communist-occupied constituencies, the National Assembly, Legislative Yuan, and Control Yuan members held their posts indefinitely. The Temporary Provisions also allowed Chiang to remain as president beyond the two-term limit in the Constitution. He was reelected by the National Assembly as president four times—doing so in 1954, 1960, 1966, and 1972. Believing that corruption and a lack of morals were key reasons that the KMT lost mainland China to the Communists, Chiang attempted to purge corruption by dismissing members of the KMT accused of graft. Some major figures in the previous mainland Chinese government, such as H. H. Kung and T. V. Soong, exiled themselves to the United States. Though politically authoritarian and, to some extent, dominated by government-owned industries, Chiang's new Taiwanese state also encouraged economic development, especially in the export sector. A popular sweeping Land Reform Act, as well as American foreign aid during the 1950s, laid the foundation for Taiwan's economic success, becoming one of the Four Asian Tigers. Chiang was suspicious that covert operatives of the United States plotted a coup against him. In 1950, Chiang Ching-kuo became director of the secret police (Bureau of Investigation and Statistics), which he remained until 1965. Chiang was suspicious of politicians who were overly friendly to the United States, and considered them his enemies. In 1953, seven days after surviving an assassination attempt, Wu Kuo-chen lost his position as governor of Taiwan Province to Chiang Ching-kuo. After fleeing to United States the same year, he became a vocal critic of Chiang's family and government. Memorial Hall and Square in Taipei. ↑ Loh 1971, pp. 20, 133. ↑ Chan, Anthony B. (2010), [Expression error: Unrecognized punctuation character "១". Arming the Chinese: The Western Armaments Trade in Warlord China, 1920–1928], Vancouver: UBC Press, Expression error: Unrecognized punctuation character "១". .
↑ Dreyer, Edward L. (1995), China at War, 1901–1941, Abingdon: Routledge, https://books.google.com/books?id=YsWOAwAAQBAJ&printsec=frontcover . ↑ ១២,០ ១២,១ [Expression error: Unrecognized punctuation character "១". Biographical Dictionary of Republican China, Vol. III], "Chiang Kai-shek", p. 322, Expression error: Unrecognized punctuation character "១". .
↑ Van de Ven, Hans (2003), War and Nationalism in China: 1925–1945, Studies in the Modern History of Asia, London: RoutledgeCurzon, ល.ស.ប.អ. 978-0415145718, https://books.google.com/books?id=tx5H_DC5V-MC . ↑ '"Chiang Kai-Shek's Secret Past: The Memoir of His Second Wife, Ch'en Chieh-ju" by Ch'en Chieh-ju and George Chan, ed. by Lloyd E. Eastman, Westview Press, Boulder, 1993, pp. 248–249. ↑ Barnouin, Barbara and Yu Changgen. Zhou Enlai: A Political Life. Hong Kong: Chinese University of Hong Kong, 2006. ↑ Romanus and Sunderland, Stilwell's Command Problem, p. 369. ↑ "True Airpower". Wings: Clash of Wings. Discovery Channel. No. 11. ↑ Foreign Relations of the United State: The Conferences at Cairo and Tehran, 1943 p. 324 "Chinese Summary Record". ↑ Gillin, Donald G. and Etter, Charles. "Staying On: Japanese Soldiers and Civilians in China, 1945–1949." The Journal of Asian Studies. Vol. 42, No. 3, May, 1983. pp. 499–500. Retrieved at: <https://www.jstor.org/stable/2055515>. February 23, 2011. ↑ Gillin, Donald G. and Etter, Charles. "Staying On: Japanese Soldiers and Civilians in China, 1945–1949." The Journal of Asian Studies. Vol. 42, No. 3, May, 1983. p. 505. Retrieved at: <https://www.jstor.org/stable/2055515>. February 23, 2011. ↑ Spence, Jonathan D. The Search for Modern China, W.W. Norton and Company. 1999. ↑ "CHINA: Return of the Gimo". Time Magazine. Monday, Mar. 13, 1950. Retrieved at <http://www.time.com/time/magazine/article/0,9171,812143,00.html> on May 16, 2011. ↑ ៨៦,០ ៨៦,១ Gillin, Donald G. and Etter, Charles. "Staying On: Japanese Soldiers and Civilians in China, 1945–1948". The Journal of Asian Studies. Vol. 42, No. 3, May 1983. p. 516. ទំព័រគំរូ:Jstor.